Wear Abouts: Welcome to Wear Abouts! great outfit post. your gold skirt is so pretty! Love the skirt! Good luck with your blog. aww rory your blog is sooo amazing!! so happy to see you've made a blog, because for one, your style is freakin amazing. i LOVE this outfit. and caaannot wait for more from you ;). and girl, YOU inspire me ;). ps. now following you on GFC & blog lovin' :). Your skirt is perfect !LOVE it. We adore your golden skirt.. Its really fit on you... The hat is also adorable.. Very cute outfit, I love the gold pleated skirt (and, your legs are so fantastically tan, lucky!). LOVE this look! I have that same skirt...wasn't it such a great buy?! Obsessed with gold lately. You styled it so perfectly...head to toe perfection! Such a lovely look! :) I love the boots and the hat! Love that skirt!!! Such a great outfit. Love, love this look! THat skirt is gorgeous! That outfit is so cute! Thanks for leaving a link on my blog! I love this! The top and skirt are so cute and those boots and socks! Ahh! I also love the hat. Everything is just perfect. Adorable. I am so jealous that you can have bare legs right now, too. i think this is a lovely start to a great blog! i wish i had a sense of style when i was your age. best of luck and i'm looking forward to your future posts. gorgeous outfit! lovee the skirt and shoes :) so glad I found you! You're gorgeous!! This outfit is pretty much perfect. That gold skirt - oh my. This is a really good outfit! You look lovely! It was fun to read too, you admitting that you had never heard about NYFW and all =) My mother works in the fashion industry and she dreamed of me being a model.. Almost fortunately I'm not tall enough, otherwise the pressure would be on! Great hat! But you might want to consider losing the fabric bracelets? This outfit is so effortlessly chic! It's amazing what a tailored blazer and a metallic garment can do for an outfit. I am also really into hats and I wish more people wore them to add a vintage touch to their outfits. All in all our outfit is very beautiful! Aww just came across your blog, you're adorable! Loving the gold skirt, it looks amazing on you! ;) I just started my blog recently as well! Awww you are soo cute and pretty! I love what you wear and really admire your style and creativity! I've started following you on my blog because you are just great! you look stunning! Love the metallic skirt! 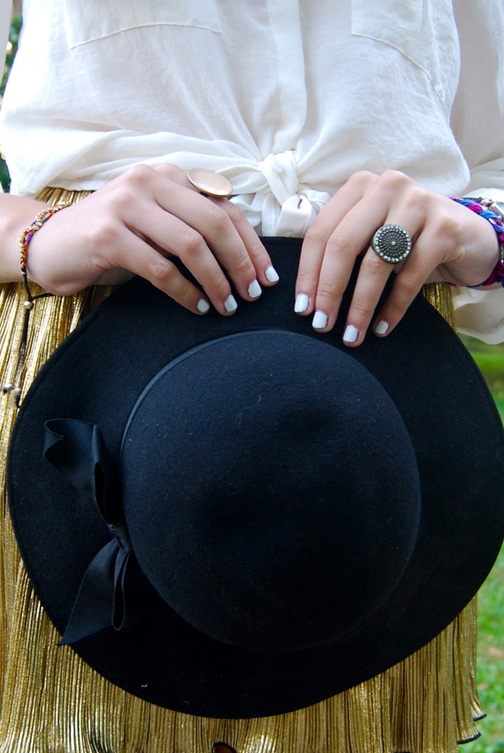 Love that metallic skirt and hat. And your white top is fab too. Cute and pretty!